Class 12 Chemistry Sample Paper (with Hints and Marking Scheme) for CBSE board exam 2018 is available here. 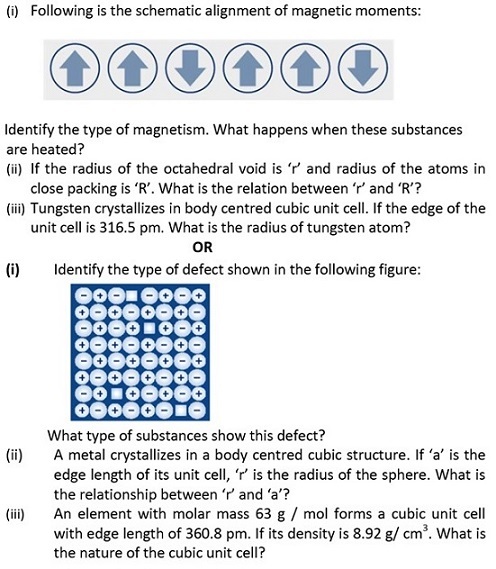 Students can download the complete Sample Paper (along with Hints and Marking Scheme). This Sample Paper is important for CBSE Class 12 Chemistry Board Exam 2018. CBSE Sample Paper 2018 for Class Chemistry board exam is available here for download in PDF format along with Marking Scheme (or Answer Key). You can download this Sample Paper (& its Marking Scheme) with the help of download link given at the end of this article. This Sample Paper is recently issued by CBSE based and it is based on latest Examination Pattern. All the questions given in this Sample Paper are very important for Class 12 Chemistry board exam 2018. (ii) Questions number 1 to 5 are very short answer questions and carry 1 mark each. (iii) Questions number 6 to 10 are short answer questions and carry 2 marks each. (iv) Questions number 11 to 22 are also short answer questions and carry 3 marks each. (vi) Questions number 24 to 26 are long answer questions and carry 5 marks each. (CH3)3C—CHO does not undergo aldol condensation. Comment. In the process of wine making, ripened grapes are crushed so that sugar and enzyme should come in contact with each other and fermentation should start. What will happen if anaerobic conditions are not maintained during this process? A coordination compound with molecular formula CrCl3.4H2O precipitates one mole of AgCl with AgNO3 solution. Its molar conductivity is found to be equivalent to two ions. What is the structural formula and name of the compound? How is Brownian movement responsible for the stability of sols? (i) Allyl cholride can be distinguished from Vinyl chloride by NaOH and silver nitrate test. Comment. (ii) Alkyl halide reacts with Lithium aluminium hydride to give alkane. Name the attacking reagent which will bring out this change. Which of the following solutions has higher freezing point? 0.05 M Al2(SO4)3 , 0.1 M K3[Fe(CN)6] Justify. The conductivity of 10-3 mol /L acetic acid at 250C is 4.1 × 10-5 S cm-1. Calculate its degree of dissociation, if Λm for acetic acid at 25o C is 390.5 S cm2 mol‒1. (i) Orthophosphorus acid is heated? (ii) XeF6 undergoes complete hydrolysis? (i) Oxoanion of chromium which is stable in acidic medium. (ii) The lanthanoid element that exhibits +4 oxidation state. (i) 2-Methyl-1-bromopropane is treated with sodium in the presence of dry ether. (ii) 1- Methyl cyclohexene is treated with HI. (iii) Chloroethane is treated with silver nitrite. (i) Alcohols are more soluble in water than the hydrocarbons of comparable molecular masses. (ii) Ortho-nitrophenol is more acidic than ortho-methoxyphenol. (iii) Cumene is a better starting material for the preparation of phenol. The rate constant for a first order reaction is 60 s-1. How much time will it take to reduce 1g of the reactant to 0.0625 g? (i) Solutions of two electrolytes ‘A’ and ‘B’ are diluted. The limiting molar conductivity of ‘B’ increases 1.5 times while that of ‘A’ increases 25 times. Which of the two is a strong electrolyte? Justify your answer. Anode : Cl2 and not O2. Explain. behaviour of adsorption from solution. (ii) What causes charge on sol particles? (iii) Name the promoter used in the Haber’s process for the manufacture of ammonia. An organic aromatic compound ‘A’ with the molecular formula C6H7N is sparingly soluble in water. ‘A’ on treatment with dil HCI gives a water soluble compound ‘B’. ‘A’ also reacts with chloroform in presence of alcoholic KOH to form an obnoxious smelling compound ‘C’. ‘A’ reacts with benzene sulphonyl chloride to form an alkali soluble compound ‘D’.’A’ reacts with NaNO2 and HCl to form a compound ‘E’ which on reaction with phenol forms an orange red dye ‘F’. 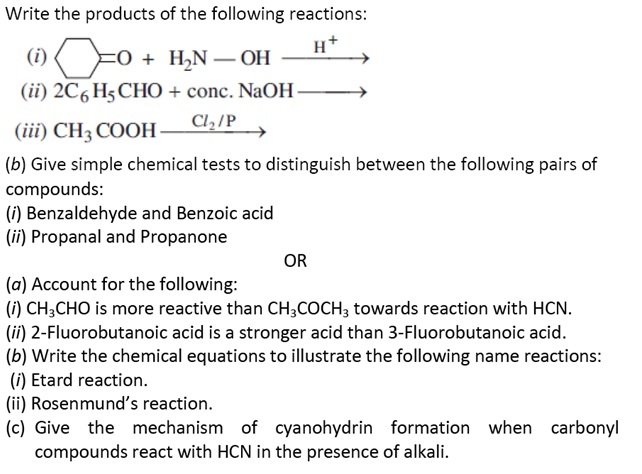 Elucidate the structures of the organic compounds from ‘A’ to ‘F’. (i) Which vitamin deficiency causes rickets? (ii) Name the base that is found in nucleotide of RNA only. (iii) Glucose on reaction with acetic acid gives glucose penta acetate. What does it suggest about the structure of glucose? (i) NaCN in the extraction of gold from its ore.
(ii) Cryolite in the extraction of aluminium from pure alumina. (i) Write the electronic configuration of d4 ion. (ii) What type of hybridisation will Mn+ ion has? (iii) Name the type of isomerism exhibited by this complex. (i) has the maximum number of unpaired electrons? (ii) forms colourless aqueous solution? (iii) exhibits the most stable +3 oxidation state? Consider the standard electrode potential values (M2+ / M) of the elements of the first transition series. (i) Eo value for copper is positive. (ii) Eo value of Mn is more negative as expected from the trend. (iii) Cr2+ is a stronger reducing agent than Fe2+. Ashwin observed that his friend Shubham was staying aloof, not playing with friends and becoming easily irritable for some weeks. Ashwin told his teacher about this, who, in turn, called Shubham’s parents and advised them to consult a doctor. Doctor after examining Shubham prescribed antidepressant drugs for him. (i) Name two antidepressant drugs. (ii) Mention the values shown by Ashwin. (iii) How should Shubham’s family help him other than providing medicine? (iv) What is the scientific explanation for the feeling of depression? (b) A colourless gas ‘A’ with a pungent odour is highly soluble in water and its aqueous solution is weakly basic. As a weak base it precipitates the hydroxides of many metals from their salt solution. (ii) Solution of gas ‘A’ with ZnSO4 solution. (a) Write the formula of the neutral molecule which is isoelectronic with ClO‒. (b) Draw the shape of H2S2O7. (c) Nitric acid forms an oxide of nitrogen on reaction with P4.Write the formula of the stable molecule formed when this oxide undergoes dimerisation. (d) Bleaching action of chlorine is permanent. Justify. (e) Write the disproportionation reaction of that oxoacid of nitrogen in which nitrogen is in +3 oxidation state.